Malta’s coast is always present since the Maltese islands are so small that the sea is always near. The island of Malta has almost 123 miles (197 km) of coastline and Gozo around 35 miles (56 km). 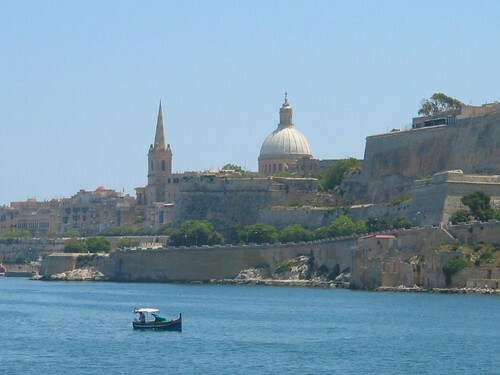 From ancient times, most of the people settled near the Mediterranean Sea forming the best coastal cities in Malta. For travelers searching for coast line, eat some fish and explore gorgeous sea shores, the Malta archipelago is something not to be missed. Best Coastal Cities in Malta are Valletta (the country’s beautiful capital), The Three Cities, Marsaskala and Marsaxlokk. In Gozo Island search for Mggar harbour, Marsalforn and Xlendi. But there are many more smaller places around Malta and Gozo waiting for you to discover them. If not the best coastal city in Malta, Valletta is at least the biggest and the richest in terms of history, architecture and things to do. This Marterpiece of the Barroque will keep you entertained for a long time, even when the many festivals and events that are held in the capital of Malta aren’t happening at the time of your visit.Read all about Valletta’s past and present in the page Valletta Maltese Capital. Perhaps we can consider the Three Cities the best coastal cities in Malta because they are the birthplace of Maltese history and also because life here is authentic, almost unchanged. Every people who settle on the islands of Malta has lived in one of the Three Cities: Vittoriosa, Senglea and Cospicua. Their harbour was the ideal place for safekeeping the boats and make trade, since Phoenician times.Their fortresses provided shelter and played such an important role resisting the Ottoman invasion during the Great Siege of 1565 that all the cities were given a name different from the original. Birgu became Civitas Vittoriosa (Victorious Town); Bormla adopted the name Cospicua (conspicuous, brave); and L-Isla won the right to be called Citta’ Invicta (invincible city), even though it is known as Senglea, after the grandmaster who built it, Claude De La Sengle. The Three Cities were where the Knights of St John first settled. So, their palaces, churches, forts and bastions are a lot older than Valletta, which was built opposite the Grand Harbour. A walk through the streets of the Three Cities takes you back hundreds of years. Watching the local festivities on festas or holy days is a spectacular thing to witness, specially Easter processions. Vittoriosa is probably the cradle of the history of Malta. This coastal city was the very first home of the Knights when they arrived in 1530 and that is why its architecture is so rich. Places not to be missed are the Church of San Lawrenz, the Inquisitor’s Palace, the Maritime Museum and Fort St Angelo (perhaps the oldest fortification on Malta). A visit to Vittoriosa Market is also a wonderful experience. Cospicua is the largest of the Three Cities and its coast, once a dockyard, is now a beautiful marina. Highlights in Cospicua are the Collegiate Church of the Immaculate Conception (which shows important works of Maltese art), as well as parts of the inland defences of the Three Cities like the Firenzuola Fortifications (1638) and Margherita Lines. This last one was, in fact, the only part of old Cospicua that survived the extensive damage provoked during World War II. Senglea was fortified in 1551 and also suffered heavy damage during World War II, with more than 75% of the buildings being destroyed. In the city of Senglea, visit the superbly rebuilt parish church dedicated to the Nativity of the Madonna and enjoy the amazing harbour views across to Valletta from Safe Haven Gardens. Nowadays, Senglea can be considered one of the best coastal cities in Malta, since the European Union awarded it with the title of European Destination of Excellence for Aquatic Tourism, in 2010. Marsaxlokk is a natural lovely harbour used throughout times by the different Maltese inhabitants.This is probably one of the best coastal villages in Malta, certainly the most photographed mainly because of the more than 250 registered fishing boats. These come in all sizes and shapes, from the modern to the traditional, but all have the traditional colours in common (yellow, blue and green) most of the time decorating the boat together with the “eyes of Osiris” painted on the prow. Like everywhere else in Malta, religion has a important part in history, architecture and daily life. Find the statues of St Andrew, patron saint of fishermen, in Marsaxlokk square, and the statue of Our Lady near the beautiful church dedicated to Our Lady of the Rosary The Madonna of Pompeii. If you can, visit the coastal village of Marsaxlokk on a festa (feast), a popular event in Malta held in the whole country. Important dates to see the religious processions and the amazing fireworks are 8th May, 1st Sunday in August and 1st Sunday in October. Near Marsaxlokk, to the west, take a look at the Tower of San Lucian, once used by the Knights of St. John to keep a watch on the sea and protect Malta from invaders. The tower is now home for The National Aquaculture Research Centre. To the east of the coastal village of Marsaxlokk, you can be a witness of the prehistoric legacy in Malta, at the archaeological site of Tas Silg. Here, there were also found remains of a Punic temple dedicated to the goddess Astarte, a Roman sanctuary consecrated to Hera, a Byzantine church and evidence of an Arab settlement. This is one of the many picturesque small fishing villages in Malta. 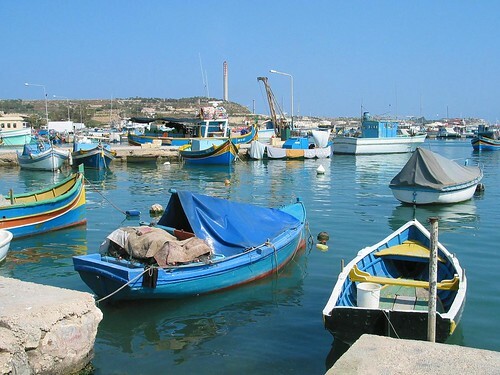 Located in the southeast, Marsaskala has a beautiful sea front where you can take a walk or sit in bars, restaurants or cafés enjoying the view over the fishing boats resting by the coast. Near Marsaskala, visit St Thomas’ Tower, some of the rural chapels in the region and the impressive rocky shore near Zonqor Point. 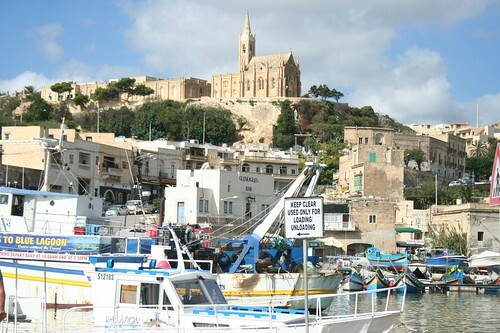 Tourists essentially know the coastal village of Mgarr for having the harbour where the ferry to Gozo from Malta’s main island arrives. One of the first things you’ll notice on the cliffs, while still on the ferry, is the Lourdes Church, a neo-gothic monument built in 1888. A bit to the left you can see part of the village of Ghajnsielem, with its parish church standing out. To the southwest, you will see the walls and bastions of Fort Chambray (18th century), the last fortification built by the Knights. But the fort only served its purpose during the resistance to French occupation of Malta in 1798. Marsalforn has been one of the best coastal cities in Gozo since it developed from a simple fishing village into Gozo’s most popular sea resort. Located on the north coast of Gozo, Marsalforn is a nice small place very popular with Gozitans on Sundays and with people from the main island of Malta in summer. However, during the low seasons, it is simply a calm coastal village. To visitors, Marsalforn offers few hotels, lots of apartments to rent, souvenir shops, restaurants and diving centres. If you like coastal villages, enjoy the beach in Marsalforn or explore the quiet bays of Qbajjar and Xwejni, to the northwest. Here, you can go for a swim or visit the salt pans from 1740, which are still producing tons of sea salt every year. For a scenic view of Marsalforn, head to the top of il-merzuq (Our Saviours Hill), where the Maltese erected a huge statue of Christ in the cross to represent their strong faith, expressed also in the many churches in Malta and Gozo. The city of Xlendi lies on a bay with the same name, perfectly confined within a rectangle of green blue Mediterranean waters surrounded by steep rocky cliffs. You won’t believe your eyes! The beauty of the fishing port of Xlendi bay has always attracted artists, photographers and some Maltese people looking for tranquility. Today, even though it’s becoming more popular and a must see coastal city in Malta, Xlendi has nothing to do with Marsalforn’s resort look. But you can still find a nice hotel in Xlendi and have a good time simply sunbathing, snorkeling and scuba diving in the caves and rugged reefs, climbing the stairs on the rocks up the cliffs to find the best views of the coast near the promontory which accommodates Xlendi Tower (1650) or trying the excellent food and drink in Malta (specialties consist of local fish and marvelous giant prawns).